SES has announced that four, new, O3b Medium Earth Orbit (MEO) satellites have arrived safely at the Guiana Space Center in Kourou, French Guiana, in preparation for launch by a Soyuz rocket from Arianespace in late March 2019. The new Ka-band satellites will join SES’s existing constellation of 16 MEO satellites manufactured by Thales Alenia Space, orbiting at approximately 8,000 km. from Earth and serving customers based in more than 40 countries. By increasing the size of the constellation from 16 to 20 satellites, SES Networks will offer enhanced coverage while providing greater service availability and reliability to cater to the increasing demand for bandwidth in the government, telecom, cloud, maritime and energy markets. 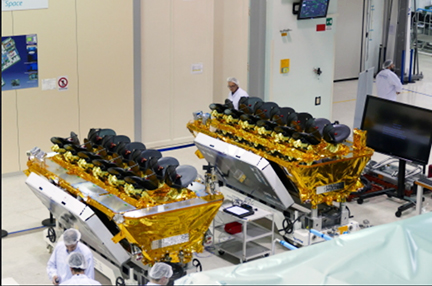 Photo of the 03b satellites post-arrival at Kourou in French Guiana for the launch in March by Arianespace. Photo is courtesy of Marie Ange Sanguy. The O3b fleet of MEO satellites is the only proven non-geostationary (NGSO) constellation to provide carrier-grade commercial broadband services today. According to the company, O3b is the only satellite-based system capable of delivering MEF Carrier Ethernet 2.0 (CE2.0) certified services, which meet the same stringent functional and performance requirements of CE2.0-certified terrestrial fiber services. The combination of O3b’s fiber-equivalent performance and massive geographic reach means the system can deliver high-performance data solutions — including cloud services and applications — across the globe. Enabled by the O3b system, SES Networks is the only satellite-based provider to be certified as an IBM Cloud Direct Link Service Provider. With these four new satellites, SES completes the first generation of a high-power, high-throughput fleet of 20 satellites operating in MEO. Each satellite has a mass of approximately 700 kilograms at lift-off and provides capacity of more than 10 Gigabits per second. Additionally, the MEO system’s next generation, O3b mPOWER, is the only fully-funded NGSO broadband system in development and will be fully-integrated and backward compatible with the existing O3b system starting in 2021. Ruy Pinto, the CTO at SES, said that since becoming operational in 2014, the unique offering of the O3b MEO system has transformed communities and disrupted industries by empowering people with new opportunities. Expanding the O3b constellation enables the company to continue elevating the connectivity experience, driving digital transformation and increasing cloud-scale adoption, by seamlessly integrating satellite-based services into the broader global terrestrial network.